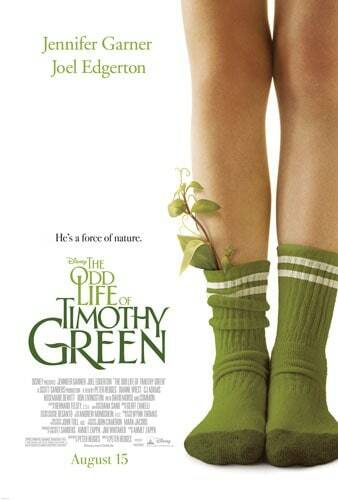 The Odd Life of Timothy Green is one of those movies that stays with you long after you have watched it. I first saw it in April when I was in NYC for the Avengers Event. I had the pleasure of watching it a second time last week while attending Blogher 12 in NYC. It was just as good the second time! The movie follows Jim & Cindy Green (played by Joel Edgerton and Jennifer Garner) as they tell the story of their experience with Timothy to the employees at the adoption agency. Jim & Cindy are struggling with infertility and have exhausted all medical options to become pregnant. They were, of course, devastated as any couple who desperately wants a child would be. The magic starts when Jim & Cindy in their grief begin writing on slips of paper the qualities that their child would have. At the end of this exercise, you can feel their mood lift with their excitement of visualizing what a child of theirs would be like. They put the slips of paper in the box and bury the box in their garden and head to bed. In the middle of the night, something miraculous occurs and they wake up to discover they have a visitor: a child named Timothy. Even stranger yet, the child is calling them mom and dad. You can almost palpate the shock and disbelief that Jim and Cindy are feeling like it was almost a dream! Timothy is no ordinary child though. He has leaves growing on his legs. Jim & Cindy want to make sure that no one sees that Timothy is different so they always cover them with high socks even when the child goes swimming. The movie touches on a few different themes that I would describe as profound. For example, Timothy, the gentle soul that he is, knows what it is like to be different. He reaches out to people who were bullied or are ashamed of who they are. He finds a kindred spirit in a neighbourhood girl who is also an outcast because of a large birthmark on his chest. They become instant friends and spend lots of time together in the forest. Another theme of the movie is to appreciate what you have while you have it. The director, Peter Hedges, touched on this topic during our group chat with him in NYC at the Avengers event. Our children are with us for only a short time and we need to cherish every moment we have because they will grow up and lead their own lives. This theme touched me to the core because I totally understand what he means. My own kids are growing up so fast and I can almost feel them slipping away as they become more and more independent. In regards to Jim & Cindy’s infertility, I can also relate to that. I struggled for over 2 years to get pregnant and know how heartwrenching it is to want something so bad and it’s just not happening. Thankfully after trying long enough, I was blessed with Bridget, but I will never forget the process it took to become a mother a second time. When you go to see this movie, bring some tissues. I cried both times and even when I think back about the movie, my eyes well with tears. John saw the movie with me last week and he also shed tears. He said the movie touched him and he could relate the lessons/experiences of the characters to his own life. He’s not overly emotional so for a movie to have that effect on him really says something. 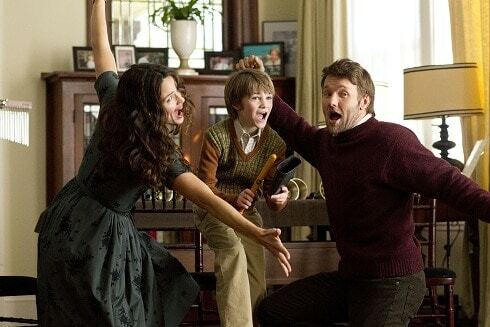 The Odd Life of Timothy Green is a movie you can take the whole family to watch- kids included! It comes out on August 15th in theatres and I would love to take both my girls to watch it! That looks like a great movie! I love Jennifer Garner too. Nice review. I was glad to meet you finally in person at Blogher. This was such a beautiful movie! We absolutely LOVED it! We laughed, we cried, then left the premier smiling. I know it will be one of those movies we just have to buy on DVD! I so badly want to see this movie- even your review made me tear up! This sounds like such a different movie. I’m glad to hear you liked it, I’ve heard great things from others as well. I have been curious about this movie and this is the first review I have seen. It dos sounds like a good movie. I will definitely bring tissues with me! Glad you enjoyed it both times.